The original dressing on the excision site should be kept in place and dry for 48 hours. The dressing can then be removed. Soaking the dressing will make it easier to remove. Allow to dry and cover the wound with a thin layer of Vaseline a few times a day. If exposed to a dirty/dusty environment, or if the stitches catch on clothing, cover the wound with a dry, non-stick dressing. Ensure hands are washed thoroughly with soap and water before attending wound care. Do not bathe the wound in the ocean. Postoperative pain is usually minimal. If you require painkillers, paracetamol tablets are recommended (Panadol, Panamax). Avoid aspirin (unless you take it every day as recommended by your GP or cardiologist) or anti-inflammatory medications. A small amount of bleeding on the first day is normal. If bleeding persists or soils the dressing, apply firm pressure over the dressing for 30 minutes. If fresh bleeding continues, call our clinic during business hours (Monday-Thursday), or visit your GP or the emergency department at your local hospital. If bleeding heavily, the ambulance service is sometimes the best option. There maybe some swelling and bruising around the wound, especially near your eyes. If this occurs, you can place an ice pack on the wound. The wound may be sore for a day or two after the operation. It should then settle. If the wound becomes increasingly painful or tender, red, warm, oozing, or you develop a fever, call our office immediately (or your GP or emergency department). Rest the area, which will minimize the risk of the wound opening. Contact us if there is any sign of the wound opening or any other complication. If we have taped the wound, leave the tape until it starts to lift. You can get this tape wet. If the wound has been left open, continue to apply a thin layer of Vaseline for a week or two. Gently massaging the wound can reduce scarring. Under your dressing, you are likely to have a padded covering which is sutured into place. This padding (see Fig 3), is called a bolster and keeps the skin graft in contact with the underlying tissues. After a few days, if the overlying dressing becomes soiled or starts to lift, it is safe to gently remove the dressing as the underlying bolster will remain in place. Removal of Sutures at Home. On occasion it might not be possible or practical to return to our clinic for removal of sutures. 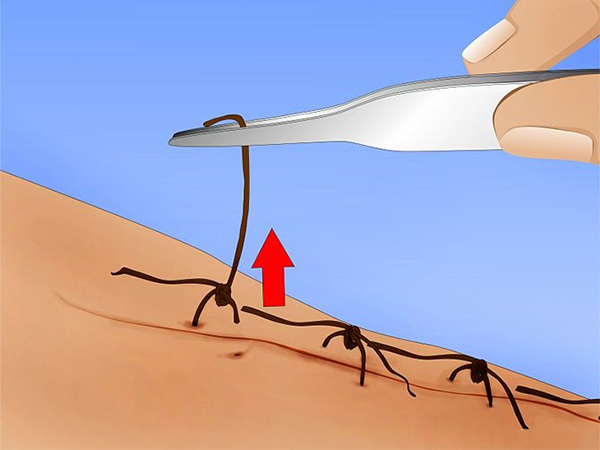 If you need to have your sutures removed away from the surgery, you can follow these steps. If there is difficulty, any sign of infection or any other complication, you should call us for advice. Also, contact us to check the pathology results and arrange any suitable follow up. It is best to use someone who has removed stitches before ... ideally someone with experience as a healthcare worker eg nurse, medic, paramedic. Fig 1. Removing sutures - only cut one thread. Fig 2. Removing sutures - suture should come out with minimal effort. Fig 3. Recent skin graft with sutured bolster.